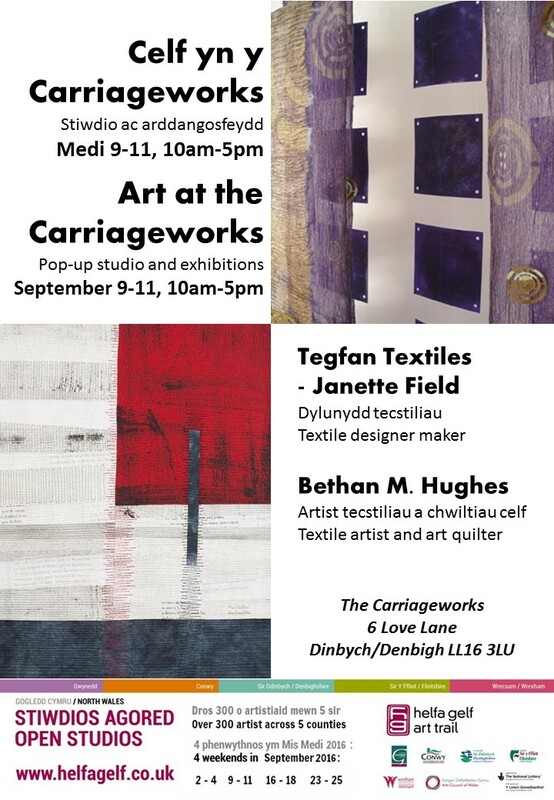 Bethan M. Hughes is taking part in Helfa Gelf, North Wales’ open studios art trail, this weekend and is setting up a pop-up studio and exhibition at the Carriageworks in Denbigh Friday-Sunday 10-5. Visitors will be able to see how she marks and prints fabric, then assembles the quilt before stitching with the machine. 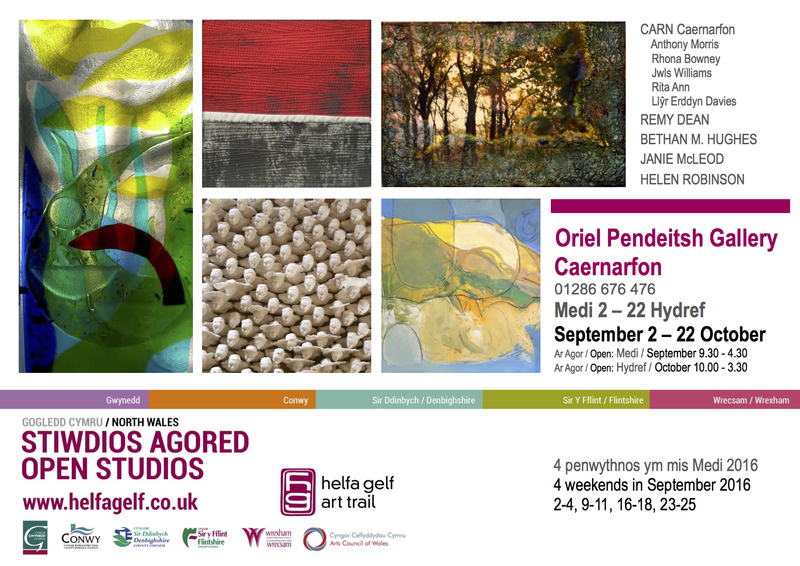 She also has work on display in the Helfa Gelf exhibition at Oriel Pendeitsh in Caernarfon until October 22. 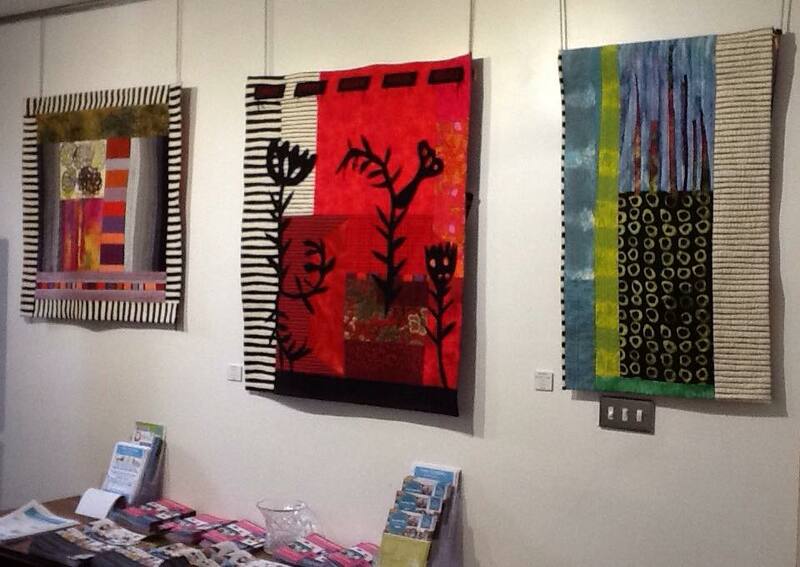 Three quilts by Judy Stephens, inspired by the gardens at Dyffryn Gardens House, a National Trust property near Cowbridge, are now on display in the foyer of Cowbridge Old Hall, an adult ed venue on the High Street. They are part of an exhibition by Vale of Glamorgan Artists. The three quilts are called (l to r) Two Thousand Dahlias, Coal Flowers and Kitchen Garden. Dyffryn House was owned by a wealthy family of coal owners who shipped Welsh coal all over the world back in the day. The magnate’s son collected trees and plants from as far as China but his speciality was dahlias and at one point he was trialling thousands of different strains. The red quilt is about the discrepancies between the sweat and toil of the mines and how they funded the magnificent gardens.